When building an application, it is critical to ensure that the users who are signing up for services or products are real users. By using Auth0, email verification services are provided out of the box; however, wouldn't it be better if verification emails didn't have to be sent at all? By using a combination of Kickbox and Auth0 Hooks, user email addresses can be validated without sending any emails. Kickbox is an email technology company with products that help verify email addresses and prevent fake sign-ups applications. To create a free account, we can visit the Kickbox sign-up page. "Kickbox ensures we only send email to real users and helps us separate the low-quality addresses from high-value contacts." To demonstrate the integration of Kickbox with Auth0, we are going to use an existing Auth0 Tenant. If you haven't already done so, sign up for a free Auth0 account here. Since we don’t want an email verification to be sent any more, we need to deactivate that option in the tenant. 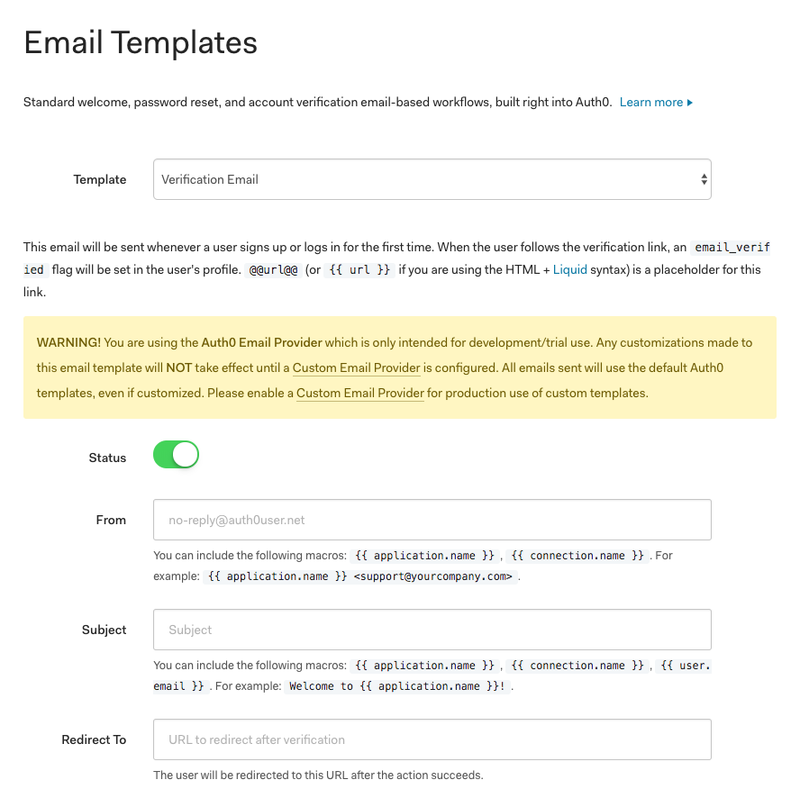 On the left sidebar of the Auth0 Dashboard, let's click on Emails first and then on Templates to get to the Email Templates section. In this section, the Verification Email template should be selected by default. Find the Status toggle and turn it off. We are now ready to add an Auth0 hook and integrate Kickbox. As stated in the Kickbox documentation, Kickbox provides us with a Sendex value which is an indicator of the quality of an email address. The existence or syntactical correctness of an email address does not indicate its quality. For example, john.smith@example.com can generally be seen as a higher quality email address than sdfsdfsdf@example.com. Is the email address similar to a known, high-quality, valid email address? The Kickbox platform is always evaluating and learning what patterns good email addresses employ. Its evolving data is used to provide insight into the overall quality of a given address. Is the email address domain a commercial domain (example: acme.com) or a personal domain (example: yahoo.com)? Does the email address appear to be associated with a role (example: postmaster@example.com) instead of a person (example: bob.smith@example.com)? The result property will tell us if this email will actually be delivered or if it's from a risky source. In our case, we will validate that this email is not undeliverable. The disposable property will tell us if this email comes from a service that offers disposable email addresses. Using these two properties with a pre-registration hook, we'll determine if we'll either create the user account or send an error at the moment of the sign-up. Auth0 Hooks allow us to customize the behavior of Auth0 using Node.js code that is executed against extensibility points (which are comparable to webhooks that come with a server). Hooks give us modularity when configuring our Auth0 implementation and extend the functionality of base Auth0 features. On the left sidebar in the Auth0 Dashboard, let's click on Hooks. 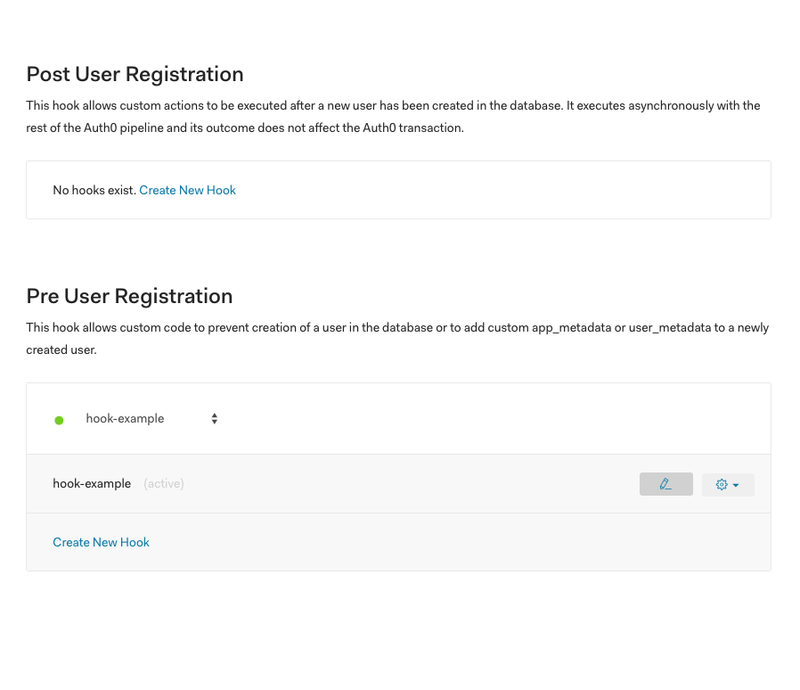 In the Hooks page, we will find different places where we can add a hook in the user login or sign-up life cycle. The one we are interested in is the Pre User Registration hook. We want to verify a user email before they register into our system. Click on the Create New Hook button. Give the hook a name. Select "Pre User Registration" from the "Hook" drop-down field. Our newly created Auth0 hook will be shown under the "Pre User Registration" section with a green dot before its name. To edit it, let's click on the pencil button in the row below it. We are taken to the Webtask editor where we can easily edit our hook logic within the Auth0 Dashboard. In here, we will be able to edit the code that gets executed every time a new user registers. We can add new metadata to our users and return this or we can throw an error which will prevent the user registration. In the URL above, <email> is the address that we want to verify and <API_KEY> is our Kickbox API key. In this case, we are looking at the Sendex score only. If the Sendex score is over 0.75, we assume that the email address is safe and good to go. There are various other checks that we could make to decide if we want to accept the user or not. Using this code will send back a generic error message to the end-user on the Auth0 Universal Login page when the user is trying to sign up with an invalid email. "Auth0 Hooks are a new extensibility mechanism in Auth0 that allows us to customize the behavior of the Auth0 platform using Node.js." This workflow may not create the most user-friendly experience. In order to show a more meaningful message, we could use the Auth0 Hosted Pages editor. Now that we have access to the Kickbox email data, we could still let our users login but we could perform email verification if we are feeling unsure. There are many other options that we can add to this workflow from here on. There is no limit at what we can do using the Auth0 hooks! I encourage everyone to give them a try.